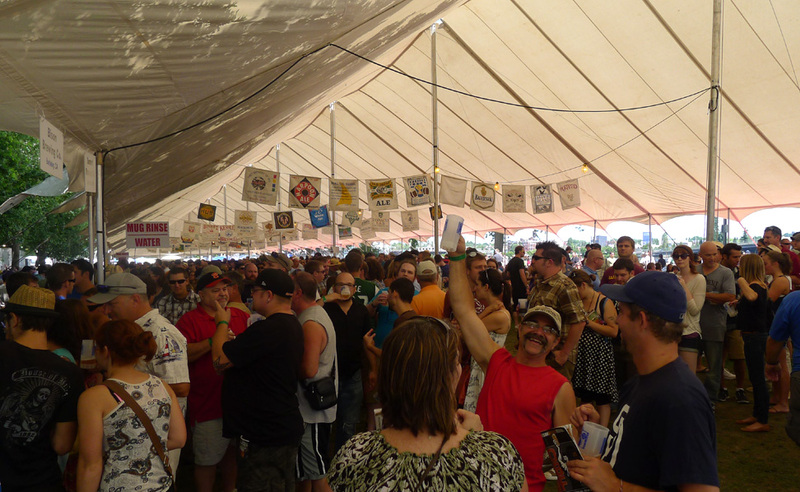 Here's a mind-altering thought: The Oregon Brewers Festival brings a significant amount of money into the Portland economy. Somewhere in the neighborhood of $30 million in 2012, according to stats released this week by OBF organizers and Eastern Oregon University Political Science Professor, Jeff Dense. Prof. Dense gave an informal presentation at the Cascade Barrel House Tuesday evening. No PowerPoint slides, whiteboards or microphones...just a group of beer geeks standing among the barrels drinking fine Cascade beers and listening to Dense talk about the data. Wait...he was also drinking a beer. I'll comment on some of the more significant findings, but first you need to know how the data was mined. Dense and a small group of students from EOU surveyed 680 festival attendees. It was a short written survey that took only a few minutes to complete. Questions focused mainly on demographics...age, gender, hometown, etc. Obviously, they asked people to estimate what they spent on the festival. Folks who took the survey got a token for their effort. Armed with the raw data, Dense used a software program to estimate the economic impact of the festival. What the program essentially did is take the data from the 680 surveys and extrapolate what it means given 80,000 people actually attended the festival. Like any survey representing a small slice of an overall group, there's a margin of error...plus or minus 4 percent, they say. 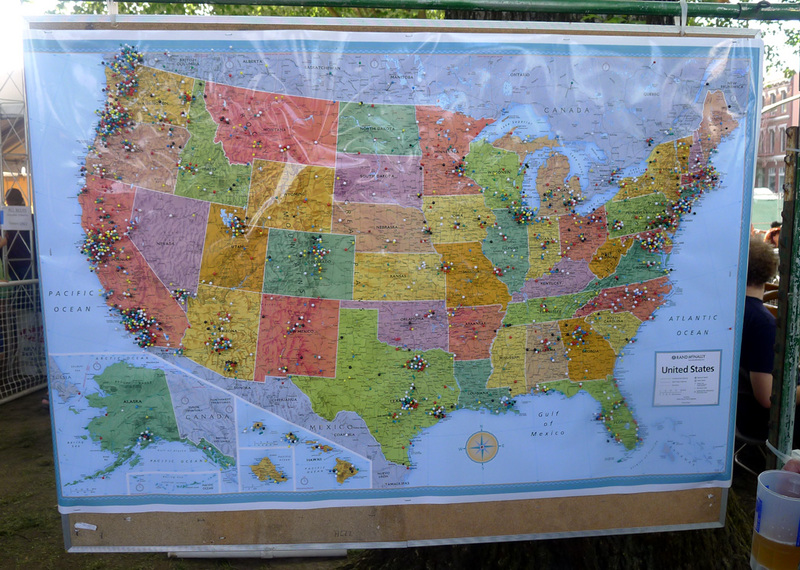 The majority of attendees (70.2%) came from OUTSIDE the Portland metro area. More than half of OBF attendees (52.1%) were there for the first time. The largest age demographic (30.2%) was 21-29. Next largest age demo: 50+ (26%). Women made up a third of all attendees. Attendees spent an average of $649. 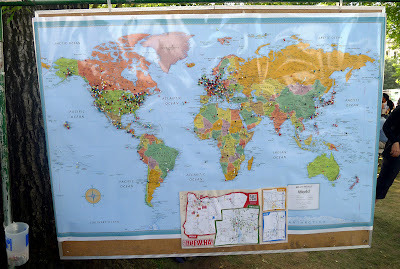 Attendees came from 39 states and 11 countries. Washington, California and Canada were the top responses. About a third of attendees participated in beer tourism as part of the festival. Deschutes Brewing (9.3%) and Cascade Barrel House (9.1%) were the most popular destinations. Quite a few people in blogland have simply posted this information without questioning its validity. As a friend of mine likes to say, journalists have become stenographers in our time. I know, I know...bloggers aren't necessarily journalists, but you get the idea. Asking a lot of questions can get you into trouble. So most simply don't. But the buck has to stop somewhere. Might as well be here. If there's a problem with the results, it likely starts with the finding that 70+ percent of attendees came from outside the area. For that to be true, something like 56,000 festival attendees had to have come from outside the Portland area. That leaves roughly 24,000 from within the area. Such numbers aren't impossible, but they seem improbable. If they are wrong, the financial impact is almost certainly overstated. More on why shortly. How could the 70 percent figure be askew? The answer may involve when and where the data was collected. Survey folks evidently set up shop in front of the Buzz Tent, near the big US and World maps...where people can place a pin to show where they came from. Surveys were reportedly done in the early afternoon each day...a good way to avoid having inebriated people clumsily filling out forms. The big question: How many came from afar? Let's look at the where. Would you be more likely meet up with a certain type of attendee in the map area? Is it possible people from outside the area would be more likely to come here (to put a pin on the map or check on where others had come from) than Portland-area residents? I'll let you decide. Then there's the when. Would collecting data in the early afternoon skew the survey results? Would someone from outside the area, someone who came here specifically to attend the festival, be more or less likely to arrive early than someone who lives nearby? Again, you get to decide. Returning to the stated financial impact, consider the $649 average for a moment. That number depends on a large number of attendees coming from outside the area. Why? Because people who live closer spent a lot less than visitors from afar. The $649 average is a direct result of the finding that 70 percent of festival goers came from outside the area, forcing them to spend money on lodging, food and travel. 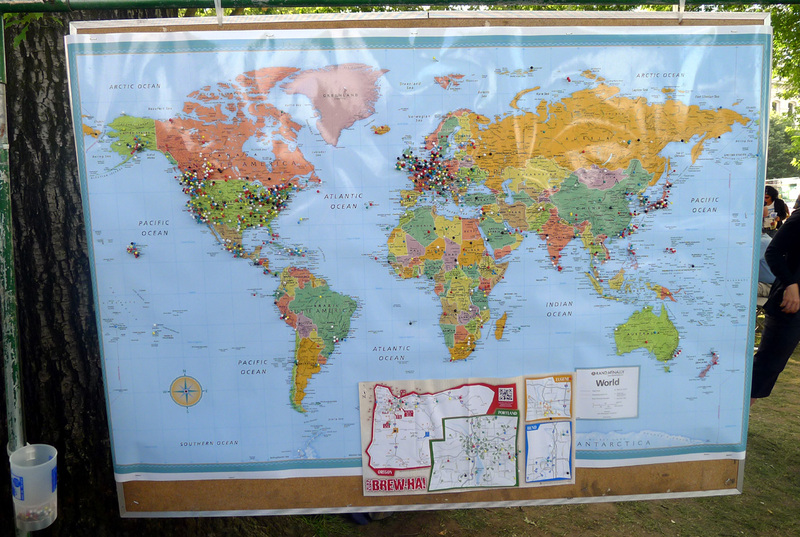 Look, we all know the Oregon Brewers Festival brings significant economic benefits to the Portland area. There's no argument there and we love it. Craft beer fans hope the numbers in Prof. Dense's analysis are right. It would be terrific if $30 million is the number. But you have to be realistic and you have to wonder. I guess I find the "outside Portland" figure at least plausible. Vancouver's outside Portland, as is every other town in Oregon. It would be nice to know how many came from outside SW WA and Oregon. For survey purposes, Portland included the metro area...Gresham, Beaverton, Lake Oswego, etc. Southwest Washington accounted for about 7 percent of attendees. I still say 70 percent from outside Portland seems high.